Thankfully, due to a confluence of factors, namely improvements in food growing and shipping technology, overall food shortages no longer cause famine or even significant food discrepancies among different socioeconomic strata in most of the world. Rather, the only mass starvations that occur in the present day are from bad politics such as kleptocracy and war causing this surplus of food from getting to those who need it. Examples of this include the wars and dictatorships in subsaharan and eastern Africa, in parts of India particularly in the 1980s, and in scattered other areas across the globe. While the continued oppression by local dictatorships, warlords, and local powers in certain parts of the world continue to cause humanitarian crises, for most of the “developed” parts of the world, or places where someone is likely to read this essay on the internet, food has become so available and affordable that obesity is no longer a desirable mark of high social status. For most people in these areas, getting obese is easy. In fact, our current ability to produce food is not just good, it is astounding. In the first decade of the 2000s, we produced enough food to give every man, woman, and child over 2,250 Calories a day. 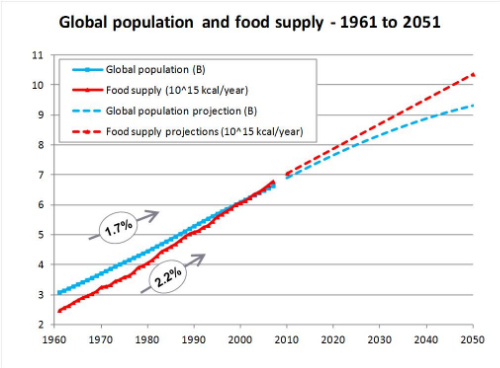 And the amount of food produced per person has gone up since then. This is far more than necessary to feed the whole world. This is especially true in the United States. Our food production and the amount of food literally at our disposal is so impressive that we throw away at least forty percent of our food. To understand the magnitude of this, consider filling the Rose Bowl to its brim with food. 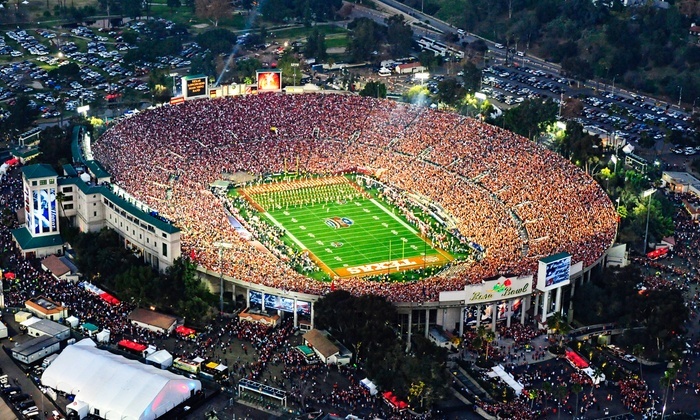 We throw between one and two completely food-filled Rose Bowl stadia away every day. And other so-called “developed” countries are comparably wasteful. Up to two of these filled to the brim with food are thrown away every day in the United States. Take a moment to ponder how incredible and unprecedented this is. To have such a surfeit of food is something entirely new in the history of the world. Recall the ancient Hebrew story of the Promised Land, where God would lead the Israelites into a land of “milk and honey” (Exodus 3:8). Or consider the ancient Chinese saying of “a fat pig at the door.” The idea of a fat pig at the ready has been traditionally associated with good luck and happiness. In fact, the Chinese symbol for home is “家”. This is made up of the components “宀”, for roof, and “豕 “, for pig. In other words, the ideal home is a roof with a pig under it. Today, for most of those in the United States, phrases and symbols such as these seem rather boring and certainly anachronistic. Milk, honey, and pork are mundane. As of November, 2015, the average price of boneless, skinless pork chops in the United States was $4.15 per pound ($4.04 in the Midwest U.S.). A friend recently bought boneless and skinless pork tenderloins at Costco for $1.79 per pound. Costco requires a membership, however. Yet, a membership is not necessary at Wal-Mart. As of this writing, Wal-Mart, the most abundant physical retail store in the United States and the rest of the world, is selling boneless pork roast for $1.49 a pound. A pound of boneless, skinless pork is 1,099 Calories and, except for Vitamin C and K and a few other micronutrients, a nutritionally complete food per the USDA. A gallon of fresh, whole, fortified milk averages $3.34 in the U.S. and $2.78 in the midwest. This is 2,400 Calories, a whole food, and virtually nutritionally complete as well. Our overabundance of food wealth extends to other, even more nutritious foods. A dozen grade A large eggs costs $2.66 in the U.S. on average. Eggs are 960 Calories per dozen and are a complete food that is so abundant in nutrients that it, along with other foods such as liver, are considered “superfoods”. Speaking of liver, this, along with other organ meats, is perhaps the healthiest food available. For many hunter-gatherer societies, organ meat was considered the prized part of the animal with muscle meat considered of inferior quality and hence given to women and animals (unless the women were pregnant, in which they also received organ meat). In 2015, five pounds of beef liver can be had from $2.76 – $10.49. As an aside, beef liver is so nutritionally dense that a healthy human should not eat more than half a pound of it weekly, or risk getting too much vitamins, namely retinol or vitamin A.
Nutrients contained in one pound of dried black beans. 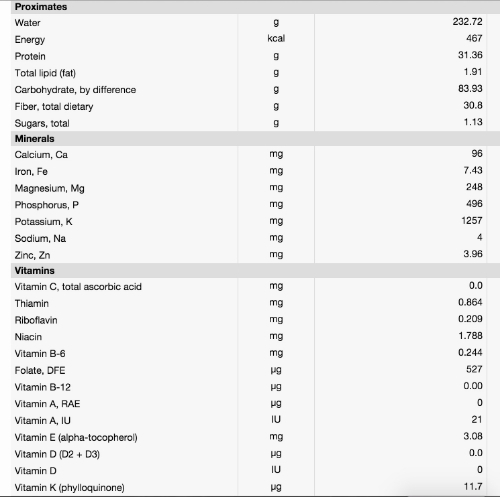 While the nutrient profile is relatively good, this is lacking in vitamin A (found in abundance in eggs and liver), vitamin C (found in abundance in leafy greens and citrus), vitamin B-12 (found in abundance in most meats), omega-3 polyunsaturated fatty acids (found in abundance in cold water fish, grass fed ruminants, and certain eggs), and iodine (found in abundance in iodized salt and seafood). Thus, historically, milk and other animal products were prized for their nutritional value and high caloric, protein, healthy fat, and micronutrient density. Of course, the nutritional merits of these foods were not expressed by our ancestors in terms such as micronutrients and whatnot. But our ancestors had a practical knowledge gleaned from millennia of cultural experience of what tended to make people healthy and what did not. As an aside, while we are talking about our ancestors, it would behoove us to recall that while there are many commonalities among the types of foods that our various ancestors cherished and made use of, there were of course many differences among our forebears both between groups and within groups over time. Consider the change in many Buddhist cultures away from meat for ostensibly religious purposes (though this did not happen with the highly religious Tibetan Buddhists, as animals were virtually the only food source that could be cultivated in their rugged terrain). Or the adoption by western Europeans of a more Islamic style diet in the early/middle second millennium (the classic meat and potatoes originated not from Christendom, but Arabia). In addition to those cultures that, for religious or other reasons, foreswore animal products, also consider those who preferred different animal products or a wide variety of non-animal foods. While the ancient Chinese valued pork, Kosher (Jewish) and Halal (Muslim) edicts forbade and forbid this. While the Okinawans favored rice and fish, the African !Kung favored animal blood and milk. The Inuit or Eskimo had an almost completely carnivorous diet consisting of primarily marine life. The northern Germanic tribes had cuisine favoring whole grain bread, milk, and ruminants. Tropical cultures had more abundant fruit and vegetation sprinkled in with their diet. 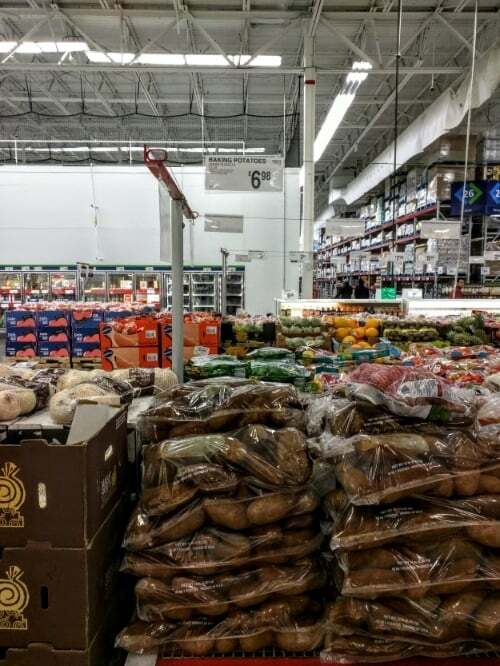 15 pounds of nutrient dense Russett baking potatoes for $6.98. This picture was taken by me in Birmingham, Alabama in December, 2015. Recall that the reason for the Irish potato famine was that it was nearly impossible for the vast majority of people in Ireland to get what we would now consider commonplace and boring. Conversely, in relationship to this wealth of food and other demographic factors, Alabama is the second most obese state in the union. Thus, while I have focused on the profound availability of those foods that were most typically prized among many of our ancestors, such as milk, eggs, and pork, due to the wide variety of some of the more divergent aspects of ancestral diets, it is perhaps also prudent to state that even these culturally varied foods are now orders of magnitude less costly in time and treasure. This is also important to consider from a health perspective. While the Inuit lived on very little vegetable matter, it is likely that most of humanity would benefit from more than just marine life in their diet. Hence the need for perhaps some starch and vegetation containing nutrients not commonly found in animal products, such as vitamin C and fermentable fiber. Regarding the latter, note that the average U.S. price of a pound of bananas is $0.59. A pound of navel oranges is on average $1.35. Legumes, a staple of many ancient cultures and a powerhouse of protein and beneficial starches, averages $1.48 per pound dried. Dried white rice, the food staple of over one sixth of the world, costs just $0.71 a pound. Think about how amazing and unprecedented this is. A pound of black beans contains 1,547 calories and over 95 grams of protein. Thus, a normal human could easily subsist on a diet of rice and beans, with the occasional egg, navel orange or other citrus, and cold water fish (such as high quality sardines, which can be purchased packed in olive oil for between $2-3 for 4.375 ounces and, like most of these foods, can be delivered to one’s home for free). This $2-3 per adult per day budget of course also extends to a wide variety of other foods and food combinations. But the good news does not end there. Even in the mythical paradise containing abundant food stores fantasized about by our forebears, it was still the consensus that turning these stores into a meal required a tremendous amount of work. In humanity’s pre-industrial days, should one want a potato or other tuber, and not be of the minuscule minority that made up the aristocracy, he or she had to dig it up. Should someone want some meat, he or she would have to kill an animal, skin it, prepare it, and all the other work entailed. Should one want a “whole grain”, one would have to go through the tremendously difficult process of hand grinding millet, rice, maize, emmer or einkorn wheat, or something similar. In a typical scenario, this would take nearly all day. And this is the best case scenario. 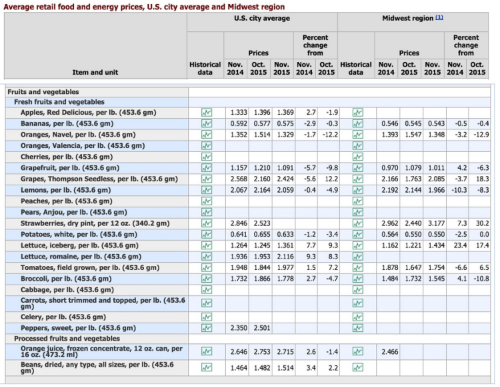 The 2014 and 2015 prices of common nutrient-dense fruits and vegetables. From the United States Department of Labor Bureau of Labor Statistics. Thus a typical United States citizen could eat a very healthy and delicious diet that would be the envy of nearly all of their ancestors from nearly every location for nearly all of time for one to three dollars a day. And they could do this while expending vastly less energy and time in food acquisition and preparation than ever before. Further, they could do this with much less risk of bodily harm, even in the most dangerous of U.S. neighborhoods. This latter part is especially true if you consider that your lifetime chance of death from homicide in hunter-gatherer times was 30-50%. This is roughly a one in three to a one in two chance of getting murdered. In the United States, your chance is one in twenty-five thousand of getting murdered. Granted, the chance of getting murdered is obviously worse in poorer areas, particularly in the inner city. But, even in the most crime-riddled US city (say, Chicago, IL or Selma, AL), things are no where close to as bad as they used to be. And all of these areas are getting better over time on average. 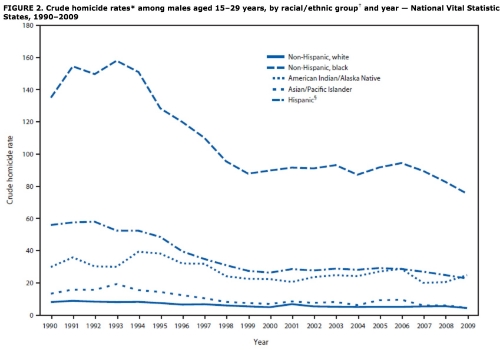 CDC Data showing that all demographics (at least in relationship to ethnicity and melatonin) are witnessing decreases in chance of dying by murder. The profound change in the ease and safety of attainment, affordability, and availability of food is profound. The vast majority of these foods are things that even those in the lowest socioeconomic strata may have at their leisure. Yet, to the ancient Chinese, Israelites, and all of our ancestors for most of history, these commodities were synonymous with an overabundance of rare good fortune. To their imagination, there could be no greater material wealth than to have stores of pork, or milk and honey, at one’s beck and call. And, again, this good fortune happened to almost nobody. Imagine the consequences, though, of finding oneself in a land not just of milk, honey, pork and eggs, but of such an abundance of already prepared food that one could have virtually anything to eat at any time. Not just an abundance of food, but also an abundance of ease in obtaining this food. All meat is already butchered, skinned, deboned and ready for some basic heating. All heating is done via electricity or natural gas. Only those who need to chop and gather wood do so not out of necessity, but for mere taste. Milk does not have to be “milked”, but rather picked up at the grocery store. This does not require rudimentary buckets to take back home, but comes filled in convenient, disposable plastic, which is then put in an electric cooling apparatus, so that any amount of milk may be had at any time. Not only are the basics covered, but an astounding variety of engineered delicacies are found that taste superior to any of those available to royalty just one hundred years ago. And these delicacies are no longer rare and expensive, but comparable in cost and ease of attainment to those whole foods idealized by our ancestors. What would be the consequence of such a utopia of food staples and delicacies? The answer is obvious. For nearly all of time, the chief existential dilemma facing the human race was the avoidance of caloric deficit. Today, however, the chief dilemma is the avoidance of partaking too enthusiastically in an overabundance of energy consumption. In particular, it is the dilemma of convincing oneself to eat foods like pork, milk, honey, and other readily available food recognizable as coming from an animal or a plant source rather than consuming too many of the class of intricate confections and other delicacies formerly only available to the aristocracy. In other words, everyone in the United States can now literally eat better than the kings and queens of old, especially in regards to intricately crafted sugar, fat, and refined flour based indulgences. The dilemma is thus no longer how do we eat like nobility. The dilemma now is convincing ourselves not to. For almost all of time, the state of humanity has been one of constant struggle to have enough to eat. To use a geological metaphor, our ancestors all lived in a “food desert.” Yet this is no longer the case. Because of massive and incredible improvements in our food production and distribution methods, most of the world not beset by kleptocrats and war has more than enough to eat. This is particularly true in the United States. In regard to food, we are no longer paupers. In regard to food, we are all aristocrats. For almost all of time, most of humanity lived in a food desert. 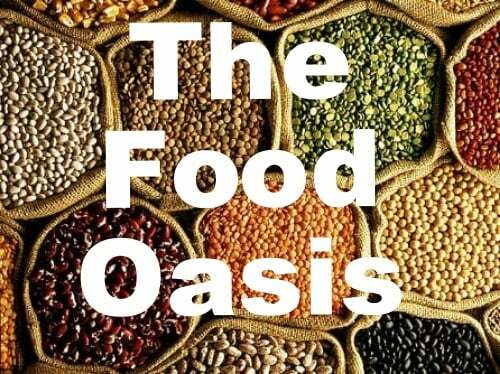 Now, we live in a food oasis.